The name Sae Wylfing was suggested by Dr Sam Newton, it means Sea wolf-cub. The boat is 13 metres long. The boat and its gear weighs 0.675 tonne. The crew and ballast weigh 0.65 tonne. Total weight in sailing trim 1.330 tonnes. It has one-eighth the volume of the full-size Sutton Hoo ship. Building commenced in February 1993. Building plans were the lines produced for the British Museum in Volume 1 of Rupert Bruce-Mitford’s The Sutton Hoo Ship Burial following Colin Mudie’s final drawings of the ship’s outline preserved in the sand at Sutton Hoo. Construction was under the guidance of Edwin Gifford a Civil Engineer and Naval architect. The shipwright was Jeff Bird. Timber. Seasoned Columbian Pine except top two strakes of radially sawn green oak. The boat belongs to the Gifford family and it has been based in the Southampton area. 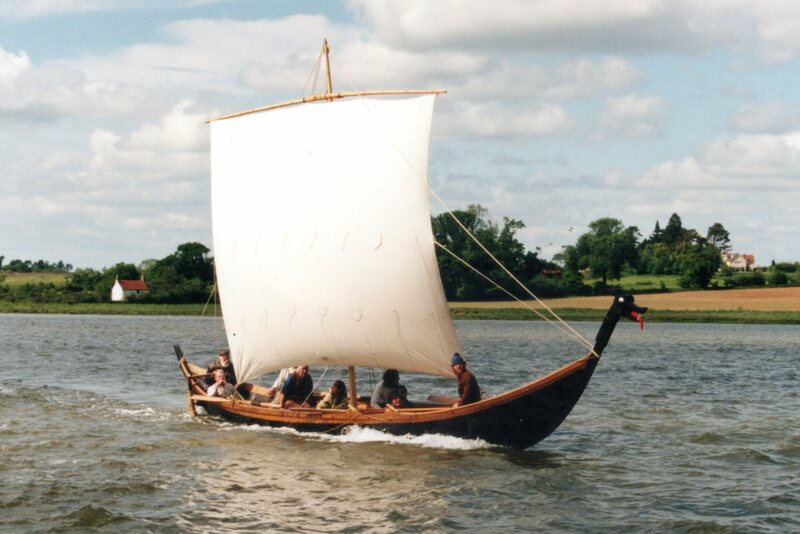 It is very relevant to Woodbridge as it was constructed to discover whether Anglo-Saxon ships could sail, with particular reference to the Sutton Hoo ship which was buried just across the River Deben from the town. 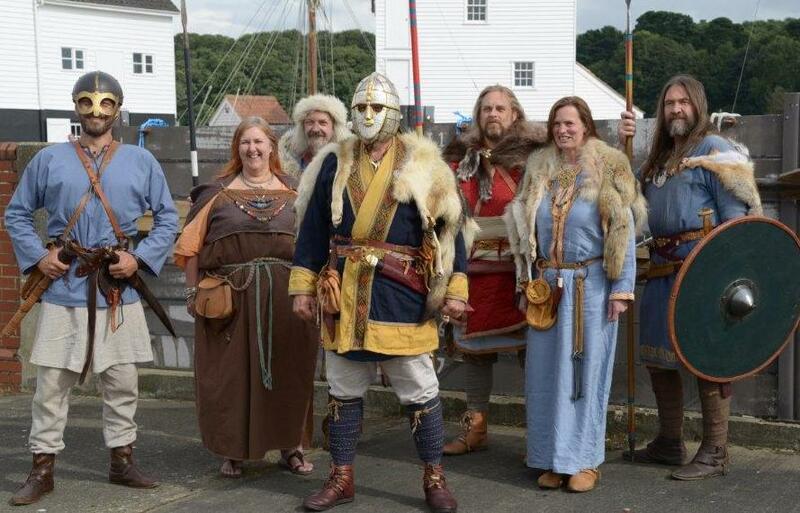 Rejuvenation of the waterfront in Woodbridge now includes a building to hold the Woodbridge Museum and a construction shed long enough to make the full-size replica of the Sutton Hoo ship. To help in raising awareness of the riverside restoration project the Gifford family have loaned Sae Wylfing to the Woodbridge Riverside Trust a voluntary community group involved with all aspects of community use on the newly developed site. A small team of volunteers has been formed to look after the craft. It is mainly shore-based. It is towed on its own trailers to various locations for the general public to see it. There is a wide range of possibilities for its use, mainly based on the educational potential of the craft. When people see it they are immediately prompted to ask questions about Anglo-Saxon culture. Who were they? Where did they come from? How did they live? How did they dress? What did they eat? There are many more questions. The boat also visits markets, local events and schools, taken there by the volunteer team. Team members need relevant skills. Vehicles and drivers help to tow the boat. Shore crew with practical skills are needed to maintain it in good order. Guides/teachers tell the story or answer the questions that arise from seeing it. The project has administrators; records of transactions are kept. Sae Wylfing is on a journey and if you have experience in meeting people, talking, explaining and inspiring, it is possible that you could participate in that journey. It takes time and a bit of work, but it delivers interest and even some excitement. Please look at the roles outlined above and see if any of them relate to you. send us an email with your name and say what interests you in the project. half model, mentioned above, that had been used to derive her plank shapes. 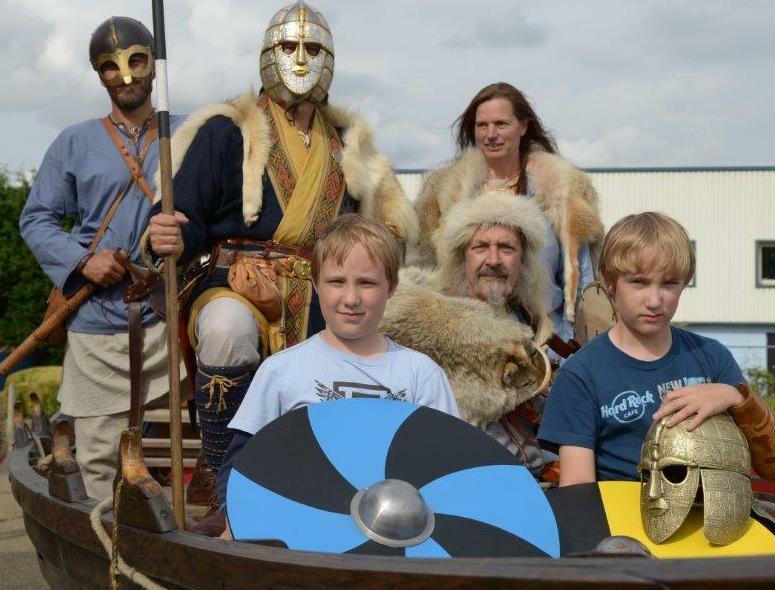 from Ealdfaeder and Wulfhoedenas together with young enthusiasts to be photographed. Sutton Hoo volunteers, and Wuffing Education were also present. take a look below this picture of the boat. and his wife Joyce were responsible for the construction of Sae Wylfing. This brief outline has been taken from a much fuller account accessed through a webpage: ramboll.co.uk. The extract concentrates mainly on Giff's connection with maritime matters, but he was equally known for his engineering work with pre-stressed concrete structures and for his pioneering work with hovercraft through Hovertravel and Griffon Hovercraft Ltd, where his legacy continues to the present day. Dr Edwin “Giff” Gifford passed away at the age of 93 on 16th May 2014 after a long illness. He was an inspired and inspirational civil engineer, structural engineer and naval architect; a remarkable innovator, inventor and pioneer whose work has had international influence particularly in the fields of bridges, roads, hovercraft, fishing and marine archaeology. Following development work on UK fishing harbours and his experiences in Africa and Central America for the United Nations Food and Agriculture Organisation, Giff came to the conclusion that building harbours and introducing industrialised western fishing methods was proving counterproductive in many parts of the Third World. He became convinced that beach landing fishing craft should improve rather than replace indigenous methods of fishing, and set about designing and developing small sailing fishing vessels of various types and materials. He eventually settled on plywood craft with “stitch and glue” hull constructions. There are an estimated10,000 plywood fishing boats, derived from this initiative, working in India today. Giff was awarded the OBE in 1981 for his work in this field. His long-time commitment to Southampton University, which began with Joyce's lectureship and their shared involvement with the university rowing club and continued with his role as a member of Council, resulted in him being awarded an honorary doctorate. Joyce died on 31 March 2014. Giff formally retired from Gifford and Partners in 1986 in order to turn his attention and energies towards the reconstruction and trialling of ancient boats. 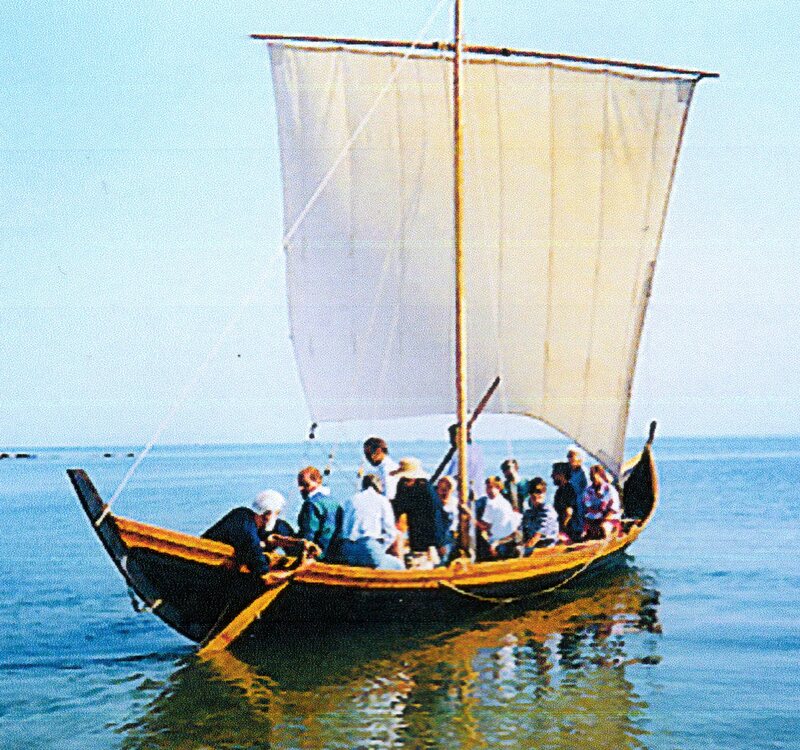 With his wife Joyce, he undertook several significant marine archaeological research projects including the half-scale reconstruction of Ottar, a 9th century Saxon longboat, the remains of which had been found in the Kent marshes at Graveney. 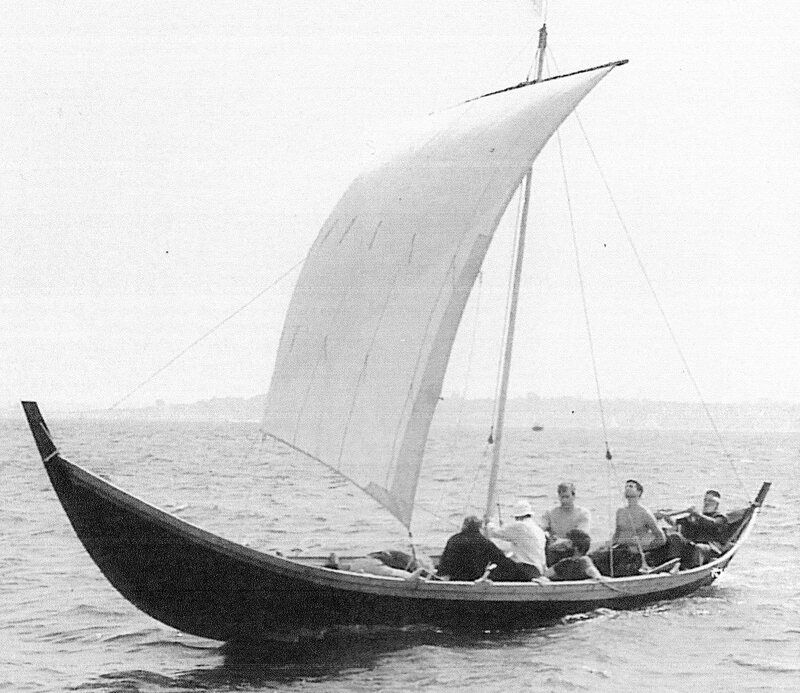 Although considered to be a rowing boat, on trials in Southampton Water he demonstrated that it sailed well and could tack into the wind, strengthening his belief that Anglo-Saxon traders used home built ships of this sort for their trade rather than relying on ships built on the Continent. In 1989 the Sutton Hoo Trust heard of his success with Ottar. They wanted to know whether the famous Anglo-Saxon longship found at Sutton Hoo, could have crossed the North Sea as the outline remains showed no evidence of a keel or mast. The Giffords again built a half-scale replica, which they named Sae Wylfing (Sea Wolf Cub) and with a loyal crew from the Colchester Re-enactment Society demonstrated that it could indeed sail very fast. Another reconstruction, this time of a much earlier, Bronze Age plank boat based on remains found at Ferriby on Humberside, featured on the BBC’s Coast programme. Click on Using Sae Wylfing at the top of the page.